The Clear-Com LQ-R IP interface devices feature four or eight ports in a 1RU form factor to extend or link any industry-standard two-wire or four-wire intercom and audio systems over LAN, WAN, or IP networks to any remote location. “Intercom and audio devices often have to be flexible and expansive to support multi-floor, multi-site or multi-venue operations,” said Stephen Sandford, product manager at Clear-Com. 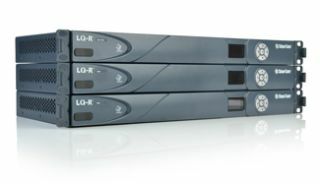 The new LQ-R devices can provide either four or eight ports per rack unit, while the compact LQ throw-down devices offer two ports of connectivity. The LQ-R devices have the option of either eight 4-wire connections, four 2-wire connections, or four 2-wire and four 4-wire connections in a single unit. The two-wire option is both Clear-Com and RTS TW compatible. A maximum of six LQ IP interfaces can be linked together in any two- or four-wire combination. LQ utilizes the low-latency audio CODEC OPUS, which features a range of different settings to provide high-quality audio on the network bandwidth available. This means that the LQ Series can be used for intercom conversation and for audio signals that need to be transported between floors or buildings, or across cities or countries. The LQ series of products can operate in both point-to-point and party-line modes allowing the user flexibility of connection to meet their workflow needs.